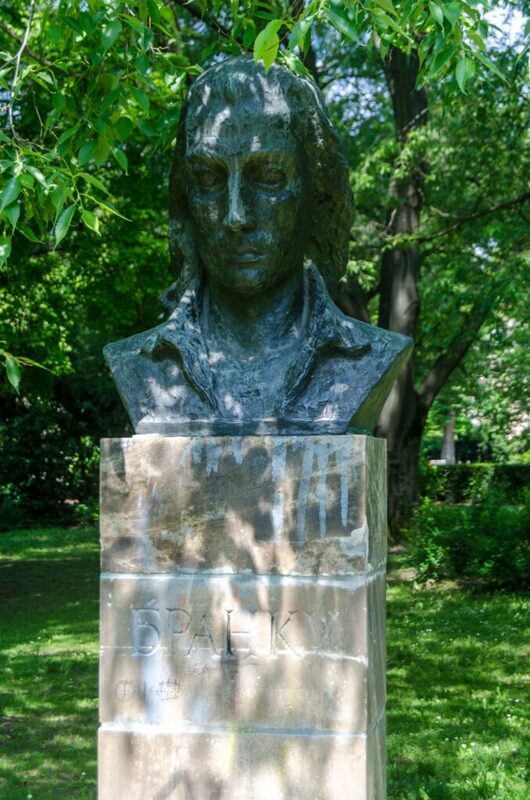 The bust of Branko Radicevic in Novi Sad is located in the Danube Park. It is made of bronze. The author is a Novi Sad sculptor Ivanka Acin who made it in 1954, but the bust is set in the park in 1974. It is 230cm high and set on a stone pedestal. Branko Radicevic (1824-1853) wrote one of the most beautiful songs of Serbian literature during the short period of his life. He was one of the most important Serbian poets of romanticism and one of Vuk’s followers who advocated for the introduction of the national language in literature. He was born in Slavonski Brod, finished secondary school in Sremski Karlovci. He studied law for a while in Vienna, then medicine in Serbia, but it was interrupted by heavy tuberculosis of whom he died. His dream was also to study painting, but the disease was undeterred. He was buried on Stražilovo. Some of his most influential poetry titles are: ” Kad mlidija’ umreti, “Đački rastanak, “Ukor”, “Njeni jadi”, “O, jesenske duge noći”.